Ganga (also called the Ganges) is the holiest of rivers for Hindus. Varanasi is the most prominent part of the river and some believe that dying there and becoming one with the holy river, will bind an end to the circle of reincarnation and lift them up to a higher spiritual state. The river-banks are therefor a site of rituals from sunrise to late night. However, The Ganga is also an important source of water for the millions of people that live in its vicinity, but has in recent years been exploited by large-scale multinational industries. The subsequent pollutions from these industries, as well as waste from the rituals, is of growing concern to the Indian government and international environmentalists. “It isn’t dirty. This is India!” the kite-running children by the river told me, while wobbling their head, in the way only Indians can \ | / In January 2010, I experimented with a participatory awareness project. My tools were old disposable cameras I got from a corner-shop in the city and the participants were the children who taught me to fly an indian kite the day before. 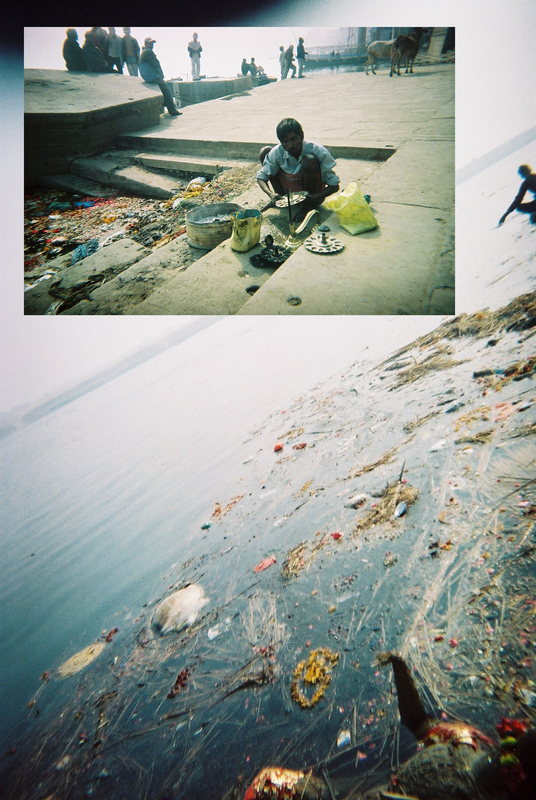 I wanted to see if the dirty Ganga was more visible through the camera’s viewfinder. Their pictures are beautiful, dynamic and showed me that a viewfinder does make you look differently and that the children saw how litter was filling the Ganga – at least momentarily. I never knew how do proceed with this project, but it got the wheels spinning towards my career as a visual and media anthropologists. Years later I am equipped to contextualize them in a photo-essay.